Battle Vision Glasses Reviews - Protect Your Eyes? Constructed from high-tech polarized plastic and shape-memory polymer, Battle Vision Glasses claim to work in whatever situation you need to minimize glare and deliver UV protection. As soon as you put them on, Battle Vision Glasses feature a blend of technologies that promise to help eliminate glare, block bright light, enhance color, and protect your eyes from UV rays so that you can see clearly and comfortably. These include high-tech polarized plastic lenses that can help you see 10 times clearer with high-definition vision, a frame constructed of a shape-memory polymer that snaps back to its original position for unrivaled flexibility, and Snake Jaw™ spring hinges. These sunglasses also feature a stylish, unisex design. But, considering the thousands of different sunglass options available online and at local retailers, is there anything about Battle Vision Glasses that might deliver more value for the money? Give us a few minutes, and we'll help you come to an actionable conclusion—starting with the basics. How Do Battle Vision Glasses Work? The American Optometric Association explains that ultraviolet rays don’t just harm our skin. The UVA (long-wave light that reaches deeper into tissues) and UVB (what causes sunburns and skin cancers) rays can also negatively impact our eyes and vision. Another possible feature to look for—and one frequently emphasized on the Battle Vision Glasses website—is polarized lenses. The American Academy of Ophthalmology explains these feature a special chemical application that filters out light rays, other than those directly approaching your eyes horizontally, resulting in a crisper, clearer appearance with details that are easier to see. With these basics in mind, let’s move on to price. How Much Do Battle Vision Glasses Cost & Where Can You Buy? According to the website, each pair of Battle Vision Glasses is one-size-fits-all and does not include an adjustable frame. Two pairs are priced at $19.99, plus $9.99 S&H. During checkout, you can add night vision, which is said to “improve nighttime clarity, reduce headlight glare, whether in the fog or rain,” for an additional $9.99 fee. You can also choose to pay another $19.99 for the Atomic Lighter. We contacted customer service for additional details, who advised that the standard Battle Vision lenses are red and orange in color, while the night model’s lenses are more green in color. Bulbhead/Telebrands offers a 30-day refund policy on all Battle Vision Glasses orders, less S&H. If your glasses ever break under normal usage, the company also provides a lifetime warranty. Either way, these can be requested by reaching out to support at 855-668-1655. Note: We also found Battle Vision Glasses for sale on Amazon at the time of our research, for about the same price. However, Prime members also received free shipping, as well as free returns if they’re dissatisfied. What Can We Learn From Online Customer Reviews For Battle Vision Glasses? On Amazon, nearly 250 customers had collectively given Battle Vision Glasses an average rating of about 3.7 stars. Common compliments cited good fit and effectiveness (blocked glare, improved vision, etc.). Complaints frequently referenced less-than-stellar quality (specifically, that the frame tends to crack and the nose piece might fall off), and that they don’t necessarily enhance vision any better than a similarly priced generic pair of polarized sunglasses often available at local big box retailers. 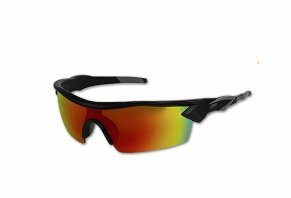 Are There Other Inexpensive Polarized Sunglasses Like Battle Vision? Even if you’re trying to remain at (or under) the $30 price point, a quick online search taking mere seconds will reveal perhaps thousands of different polarized sunglass options from hundreds of manufacturers, in just about every imaginable size, shape, color, and design. And because of their polarization, they’ll also “block bright light and glare so you can see clearly,” just like Battle Vision Glasses. In addition to the AOA’s recommendations above, how can you narrow down your choices and pick the option that might deliver the most bang-for-your-buck? In other words, what other important factors should you focus on when purchasing your next pair of sunglasses? As we learned when writing Are High-Priced Sunglasses Worth the Price, there’s no relationship between the color of a lens, the darkness, and the price when it comes to its ability to block out UV rays. However, remember the UVA and UVB rays we briefly discussed earlier? You'll want to explicitly choose a model that promises to block out 99 percent of these potentially harmful rays. Note: None of the customer support representatives we spoke with were able to provide specifications about what percentage of UV rays Battle Vision blocks out. In the end, we didn’t test Battle Vision Glasses ourselves to provide firsthand feedback. However, based on what we learned from the manufacturer’s website, online customer feedback on sites like Amazon, and from our past research into budget vs. high-end models, it seems like they might deliver essential features like polarized lenses and frame flexibility at a competitive price. These frames are one-size-fits-all, however, so if they don't fit properly or don't meet your design preferences once you actually have them in your hands, BulbHead/Telebrands offers a 30-day refund policy. Just keep in mind that according to many online customers, Battle Vision Glasses don’t necessarily perform any better than a similarly priced local pair. Also, many emphasize that the frames can scratch easily, so you’ll want to take special care when cleaning. Specifically, the manufacturer recommends only rinsing with warm water and a small amount of soap and avoiding any abrasive or ammonia-based chemicals, which can cause damage. I bought two pairs. In less than two months, the outer finish on the lens was coming off on both pairs so bad that they were unusable. I only used water and a soft cotton cloth to clean them. I contacted the seller to get a return and refund. His response was that it's been over 30 days, so I can't return or get a refund. Don't waste your money on these, they won't last. Write a Review for Battle Vision Glasses!